It’s map Monday. 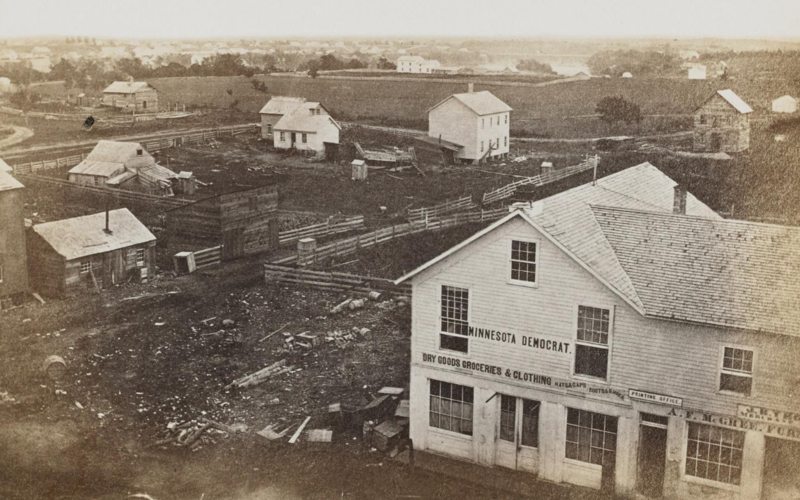 Today, we are going back to the 1850s when Minneapolis was little more than a muddy village. Although the city saw a surge of development during the second half of the decade, it was still a far away from the industrial metropolis it would become. The population in 1858 was a meager 4,238 residents. The roads were dirt tracks. There was no fire department. Sewage flowed into the streets, and most city blocks existed in name only. This was a transitional period for the “Village of Minneapolis.” Although St. Anthony was still the larger town, Minneapolis was rapidly closing the gap. The main draw of Minneapolis over its sister city across the river was the shared headrace canal constructed in 1856. This waterway enabled any mill along the canal to harness the power of the falls. The economic potential of this canal drew in industrialists from around the country. By 1858, “the town site of Minneapolis and [its] water power,” was making the pages of the Washington D.C. Evening Star. As new mills popped up, new residents moved into the city to work them. By the beginning of the next decade, Minneapolis was an undeniable boom town. The map above offers a snapshot of Minneapolis as it began its transformation from farming village to industrial powerhouse. Drawn by Orlando Talcott in 1858, his “Building Map of Minneapolis” shows a city on the rise. Considering Talcott ran a local land agency when he was not moonlighting as a cartographer, the presentation of the city as a boom town makes sense. Talcott had a vested interest in making Minneapolis appear like a good investment, and he constructed his map to make that argument. The margins are full of detailed depictions of notable local landmarks like the Nicollet House. The price tag—the Nicollet cost $50,000 to build—is also prominently displayed. The legend proudly proclaims that more new buildings went up in 1857 than in all previous years combined, with the “ratio of new to old buildings” an impressive 5:4. Yet the neatly ordered streets and economic boasts populating the map only tell part of the story. The rough origins of the city are notably absent. The cartographer depicts the new mills, hotels, and mansions built in the city—not the saloons and tenement houses. This application attempts to offer a more nuanced take on Minneapolis. By exploring Talcott’s map, we can examine the things he chose to omit as well as depict. The mapping application was built in collaboration with the Borchert Map Library. The 1858 map used in the application was provided courtesy of the Hennepin History Museum. Other sources include: “History of the City of Minneapolis” by Issac Atwater, Zalusky’s “Early Theater or the History of Entertainment in Minneapolis” and the Washington D.C. Evening Star. This entry was posted in Map Monday and tagged map monday, maps, Minneapolis.